By moving a ground penetrating radar's antennas along the surface of the ground in a raster scan pattern, we can produce a map of subsurface features. 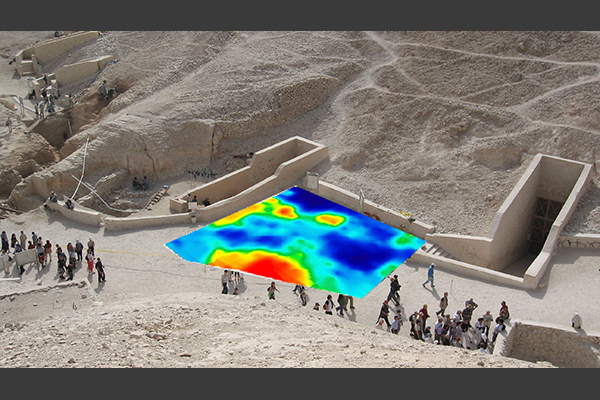 This map shows what lies a few feet beneath the ground between KV 10 and KV 11 in the Valley of the Kings. The red areas produced strong radar reflections, meaning that there are anomalous features beneath the surface at those locations. Not all of these anomalies are archaeological features, however. The large red spot at the bottom of the scanned area, for example, was caused by an electrical conduit. The work of the Glen Dash Foundation was performed for the Supreme Council of Antiquities, Dr. Z. Hawass, Secretary General.